Refill your planner and keep organized with the two-page per month refills that feature tabs, notes section, to-do & review pages. Organize filler pages according to your note-taking needs Part of the premium TUL Custom Note-Taking System that allows you to add or remove pages. Sold separately. This premium paper offers a smooth writing experience that won't bleed through. Available in a variety of formats for you to mix and match refill page types within your notebook. 11-hole punched sheets are ruled with 1 column and 39 lines. If you've got a lot on your mind and your schedule, these adorable and functional daily pages are perfect for you! the front of each daily sheet features a spot for you to identify your top 3 Priorities; a inch get it done" list; an hourly breakdown; and a gridded inch brain dump" page on the back for all of your big ideas! each package includes 40 pre-punched, daily sheets. Replace or add monthly calendars into your planner with loose-leaf AT-A-GLANCE Day Runner monthly planning pages. These size 4 planning pages are laid out with one month per two page spread and are tabbed to allow quick turning to any month. The 12 month calendar pages include world holidays and run from January to December. Julian dates. Each monthly calendar features unruled daily blocks with plenty of space to plan across the Monday - Sunday format. Months also include a ruled notes column to jot down to-do's and important information and a quick scan section along the left edge to record multi-day events. Past, current and two future month calendar reference blocks are also shown. 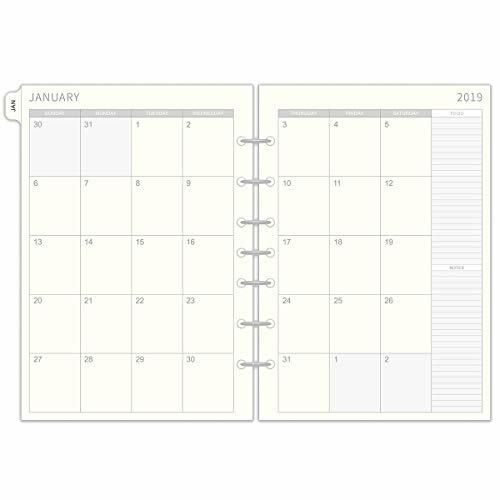 Each loose-leaf calendar page is 5-1/2" x 8-1/2" and pre-punched with 7 holes for use with size 4, 7 or 3 ring AT-A-GLANCE Day Runner express planners. Monthly planning pages are constructed from bright white paper with 30% post-consumer waste. All your planning needs in a slim and compact, intuitive and easy to use planner. Made in the U.S.A. One month per two page spread with unruled daily blocks. Notes column included. Refill pages are loose-leaf and 7-hole punched. One month per two-page spread with reference calendars. Bright white paper contains a minimum of 60% post-consumer waste recycled material. Appointment book/planner cover sold separately. 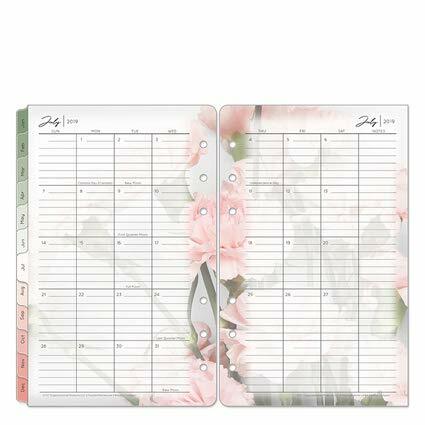 Each loose-leaf calendar is size 4 and measures 5-1/2 x 8-1/2. 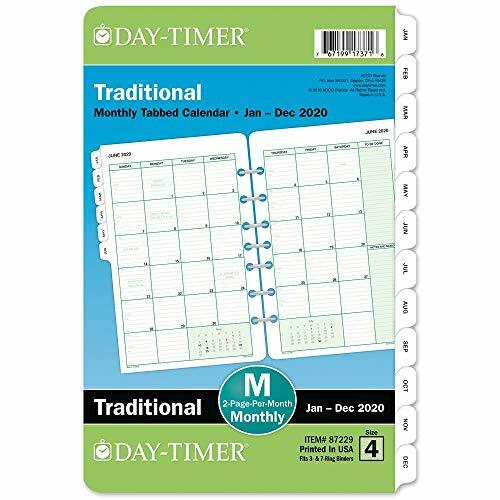 Refill your planner with the Day-Timer 2-pages-per-month portable size that gives you a set of 12 monthly planning calendars on heavy-duty loose-leaf sheets. Available in quarterly starts: January - December, april - may, July - June or October - September. The 2-paged-per-month spread is perfect for organizing your daily schedule with ruled block and Sunday through Saturday scheduling. Past and current month s reference on the bottom of ever monthly two-page spread for quick date checking. Ruled to be done and notes space on the right hand page of every monthly spread gives you plenty of room to jot down important daily details. Months are tabbed for quick date look-up. Includes spacious monthly to-do and diary sections. Pages are loose-leaf and pre-punched with 6 holes. Page size is 3-3/4" x 6-3/4". 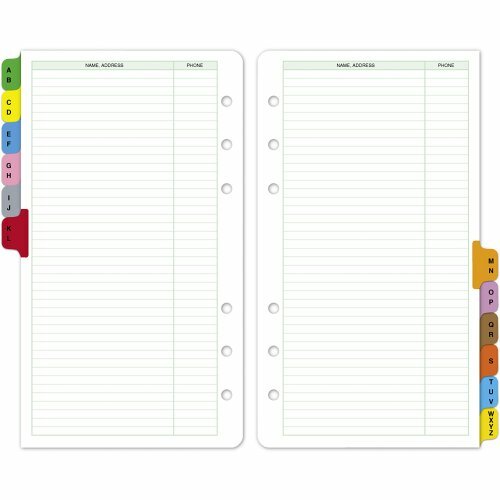 Refill pages refresh your planner or add extra pages to your existing set. 12 month set runs January - December. One month per two page spread features ruled daily blocks for neat notes. Each date is conveniently divided into am, noon, pm and evening. To-do list and notes section also include on each monthly spread. Past/ future month calendar blocks shown for reference. Months are tabbed. Spacious monthly to-do and diary pages included. Refill pages are loose-leaf and 6-hole punched. Compatible planner covers sold separately. Portable size; 3-3/4 x 6-3/4 pages. Keep track of deadlines, special events and more with clear and simple organization. The Monthly Desk Calendar Refill covers 12 months, January 2019-December 2019. Each month covers a two-page spread. The ruled daily blocks are divided into AM, Noon, PM and Evening to keep plans neat and organized. Pages measure 5-1/2" x 8-1/2". These pages are designed to fit a 7-ring, desk size 4 organizer. Each spread has space for to-do lists and notetaking to help you stay on top of your schedule. Reference calendars let you look ahead for future planning. Each spread has space for to-do lists and notetaking to help you stay on top of your schedule. Reference calendars let you look ahead for future planning. 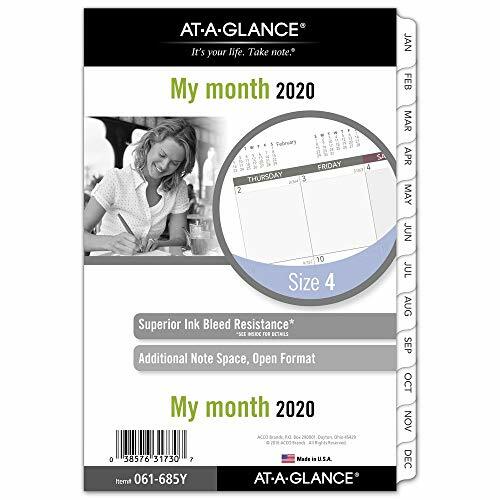 YEAR-ROUND PLANNING - Desk size refill covers 12 months, January 2019-December 2019. Keep track of deadlines, special events and more with clear and simple organization. MONTHLY VIEWS - Each month covers a two-page spread. The ruled daily blocks are divided into AM, Noon, PM and Evening to keep plans neat and organized. Pages measure 5-1/2 x 8-1/2. 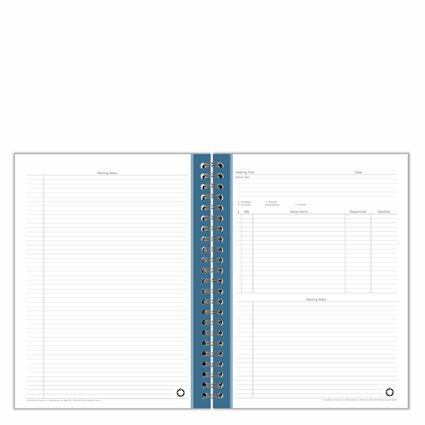 REFILL ONLY - These pages are designed to fit a 7-ring, desk size 4 organizer. ENHANCED ORGANIZATION - Each spread has space for to-do lists and notetaking to help you stay on top of your schedule. Reference calendars let you look ahead for future planning. The Kathy Davis weekly planner refill features colorful artwork with inspiring quotes for motivation to stay organized all year long. Its dated pages run 12 months from January - December with one week per two page spreads and appointment times for clear planning. Hourly appointments are listed from 8:00 a.m. - 5:00 p.m. Monday - Friday and 8:00 a.m. - 12:00 p.m. On Saturday and Sunday. Refill includes inspiring quotes from Kathy Davis featured on each weekly spread. Its colorful, monthly tabs make it easy to find any date at a moment's notice. Coordinating page locator also included. Refill is 7-hole punched for use with a desk size planner cover. 5-1/2" x 8-1/2 page size. Kathy Davis weekly planner refill features colorful artwork with inspiring quotes for motivation to stay organized all Year long. Dated pages run 12 months from January - December. One week per two page spread. Hourly appointments are listed from 8:00 a.m. - 5:00 p.m. Monday - Friday and 8:00 a.m. - 12:00 p.m. On Saturday and Sunday. Inspiring quotes from Kathy Davis. Tabbed months. Coordinating page locator also included. Refill is 7-hole punched for use with a desk size planner cover. 5-1/2 x 8-1/2 page size. The Diane stylist profile cards comes in white and is perfect for stylist client date recording. There are 80 pages in each unit. This fits perfectly in the standard 8.5" x 5.5" binder. Free Diary Weekly 12 Month Summary + 6 Month 26 Week Detail Yearly Planner Journal Refill Insert - to Do List + 2019 Daily/Yearly Calendar for Standard Regular Size Travelers Notebook TN 8.5" x 4.75"
The Perfect Diary and Weekly Planner! 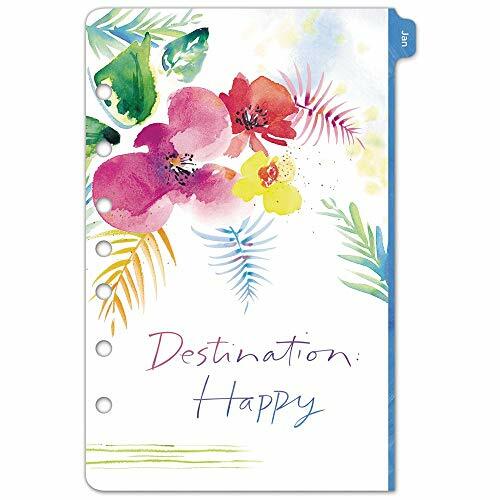 This unique planner insert offers a stylish, versatile and individual way to keep a diary and get organized. 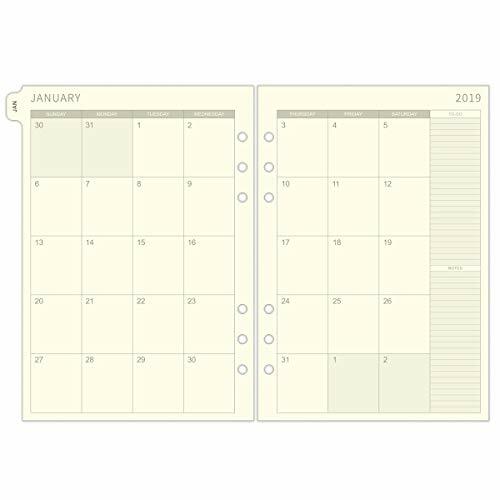 Great for starting a new calendar at any time of year - since there are no dates already written in you're not forced to start at the beginning of the year. There's a total of 26 separate weeks for daily planning so you can record diary entries, to-do-lists, notes, menus or exercise plans for each day over 6 months. One spread for each week - the left page shows each day of one week and the right page offers a useful grid for check lists, doodling or diagrams. Track the weather, set your goals, rate your week or add an inspirational word for the week. And that's not all! There are other sections for storing personal details, adding short and long term goals, monthly planning, keeping birthday and contact lists as well as creating your personal bucket lists! Designed to fit Sovereign-Gear's Leather Refillable Traveler's Notebook (search for B01M0WWTP6) but will also fit all similar Midori style standard refillable Traveler's Journals. Use this planner insert for daily entries in a bullet journal and organize your refillable journal for writing, sketching, drawing, diary keeping and notetaking. Check out our other refill listings - search for Sovereign-Gear - for more great options including 3 paper packs, extra elastic straps with toggles, PVC card holder with zipper pocket, brown card holder, metal penholder clips and stylish pens. So buy your planner insert now to enjoy your refillable journal for a lifetime! 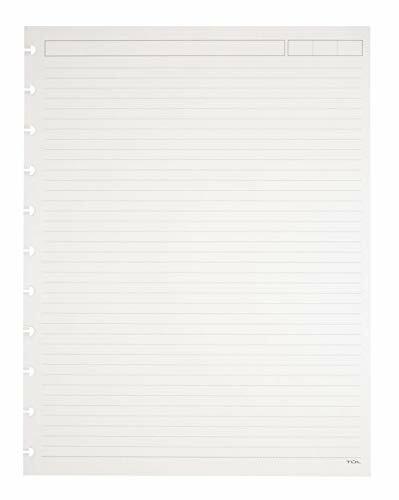 Blank paper from Handy Forms for your 6-ring A5 size planner by Filofax, LV (GM), Kikki-K, TMI, etc. Exceptionally high quality, heavy paper (120 gsm) with a silky-smooth surface. A5 size blank pages . Punched with 2 groups of 3 holes spaced 3/4 (19mm) with 2-3/4 (70mm) between the groups to fit the popular 6-ring A5 size notebooks by Filofax, LV (GM), Kikki K, TMI, Quo Vadis, and others. Page size is 5.83 x 8.27 (148mm x 210mm). Printed on exceptionally high quality heavy weight paper (120 gsm), with a silky-smooth writing surface. Does not bleed through. Take advantage of separate spaces for office, home, mobile, and fax numbers, and e-mail address. Phone and address directory has double the space of our other styles in a compact, 3.75 x 6.75 inch portable size. Alphabetical tabs are easy to find in your binder as they're not only bright, but the extend out from the planner. SinnWunder means "Sense of Wonder" and this is what our products stand for. Everything must be wonderful but not without being sensible at the same time. The refills are punched to fit 6-ring A5 planners. 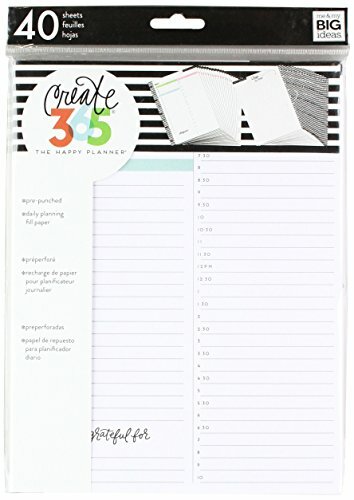 There are 2 groups of 3 holes spaced inch (19 mm) with 2 inches (51 mm) between the groups to fit the popular organizers and planners with 6 rings by Filofax, Kikki K, Kate Spade, Quo Vadis, TMI, Succes, Van der Spek, elfenklang, Websters Pages Color Crush, Louis Vuitton, TimeSystem, Gillio, Dokibook and other. Please check the rings of your planner and the size of the paper before placing the order. We chose a high quality paper that will hold up to your daily use. Filofaxing fans will also love it, because it is perfect for stamping, stickers, Washi Tape and coloring. Please note that depending on your monitor settings the colors might vary with the look of the printed product. Daily refill provides an extra year of planning pages to re-use an existing appointment book cover. High-quality paper features superior ink bleed resistance. 12 months of loose-leaf daily planning pages from January - December with Julian dates. One day per two page spread includes space to track priorities, quarter hourly appointment schedule, expenses and a full page daily diary for detailed plans. Reference calendar blocks also shown for quick date checking. Quarter hourly appointment times from 8:00 a.m. - 7:30 p.m. And half hourly from 6 - 7p.m. Are listed on the left hand page of each daily spread. Tabbed, two page monthly overview pages with ruled daily blocks for event planning also included as part of the refill set. Loose-leaf notes pages and reference calendars included. 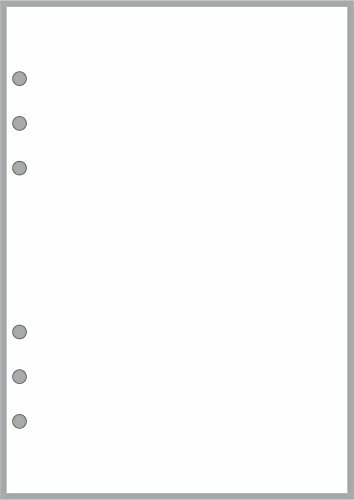 Loose-leaf refill pages are 7-hole punched and measure 5-1/2" x 8-1/2" (size 4). Planner cover sold separately. 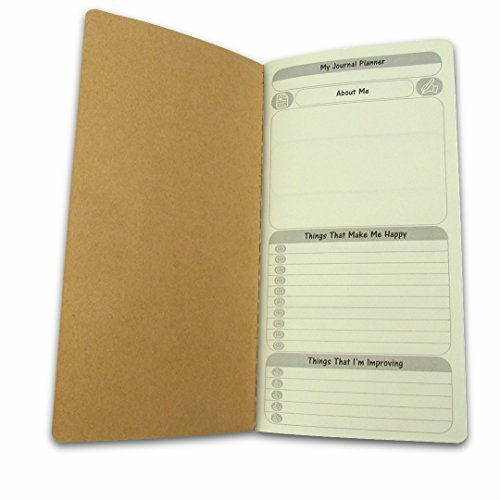 Daily refill provides an extra Year of planning pages to re-use an existing appointment book cover. 12 months of loose-leaf daily planning pages from January - December with Julian dates. One day per two page spread. Quarter hourly appointment schedule, expenses and a full page daily diary. Reference calendar blocks. Times from 8:00 a.m. - 7:30 p.m. and half hourly from 6 - 7 p.m.
Tabbed, two page monthly overview pages with ruled daily blocks. Loose-leaf. Printed on quality paper containing a minimum of 60% post-consumer waste recycled material. 5-1/2 x 8-1/2 page size. Record the meeting goal, action items, assignments, and take all the notes you want. This clear, crisp notebook with clean white writing space is a great way to keep meeting information organized. Includes two notebooks. 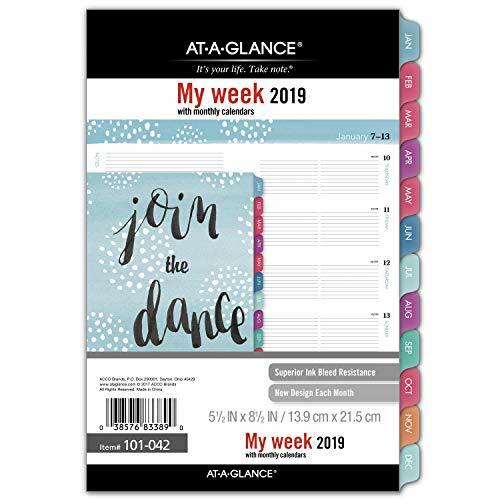 The AT-A-GLANCE Day Runner daily 12 month planner refill includes a full year of daily pages from January - December with Julian dates. High-quality paper features superior ink bleed resistance. Its one day per page spread lists hourly appointment times from 8:00 a.m. - 7:00 p.m. Additional notes space is included at the bottom of each page for extra reminders. 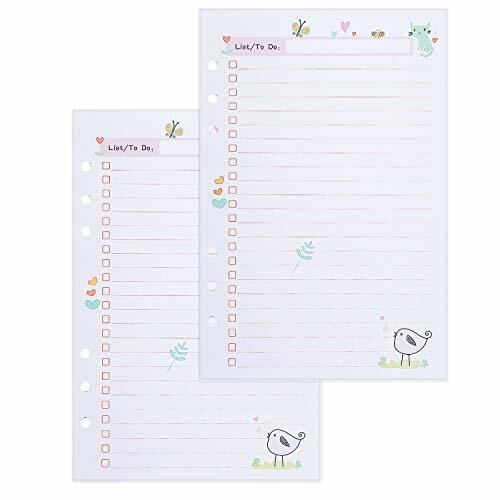 Refill pages are loose-leaf and 6-hole punched for use with a ring planner cover. Appointment book/planner cover sold separately. Size 3 refill pages measure 3-3/4" x 6-3/4". 12 month refill includes a full year of daily pages from January - December with Julian dates. One day per page spread lists hourly appointment times from 8:00 a.m. - 7:00 p.m. Bright white paper contains a minimum of 60% post-consumer waste recycled material. Additional untimed notes space is included at the bottom for extra reminders. 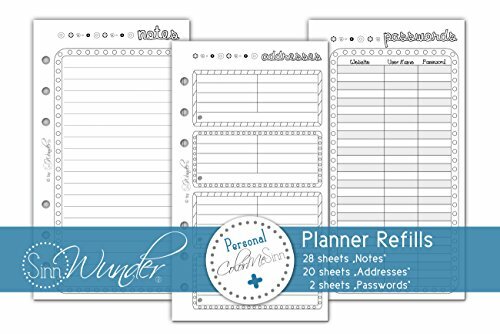 Refill pages are loose-leaf and 6-hole punched for use with a ring planner cover. Appointment book/planner cover sold separately. Size 3 refill pages measure 3-3/4 x 6-3/4. Chris.W use the high quality Dowling paper to manufacture trustful products for our customers. Product detail: 17.3cm x9.5cm, A6 Size, 6 holes enable to use on the most of planners and organizer. 40 sheets. 100g high quality acid-free papers make writing extremely comfortable. Pack of 40 sheets/80 pages. 6-hole punched. Keep track of deadlines, special events and more with clear and simple organization. 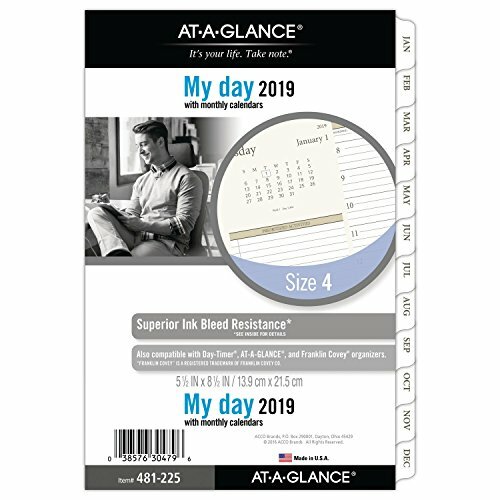 The AT-A-GLANCE Day-Timer Planner Refill covers 12 months, January 2020-December 2020. One month covers a two page spread. Features ruled daily blocks for AM and PM planning, space for notes and reference calendar blocks. Pages measure 5-1/2" x 8-1/2". Expand your organizational skills with special features, including tabbed months, spacious monthly to-do s and diary pages. Refills allow you to reuse your favorite refillable cover each year. This refill is pre-punched for use in a 7 ring, desk size (size 4) organizer, sold separately. YEAR-ROUND PLANNING - Refill covers 12 months, January 2020-December 2020. Keep track of deadlines, special events and more with clear and simple organization. MONTHLY VIEWS - One month covers a two page spread. Features ruled daily blocks for AM and PM planning, space for notes and reference calendar blocks. Pages measure 5-1/2 x 8-1/2. ENHANCED ORGANIZATION - Expand your organizational skills with special features, including tabbed months, spacious monthly to-do's and diary pages. REFILL ONLY - Refills allow you to reuse your favorite refillable cover each year. This refill is pre-punched for use in a 7 ring, desk size (size 4) organizer, sold separately. Keep track of deadlines, special events and more with clear and simple organization. 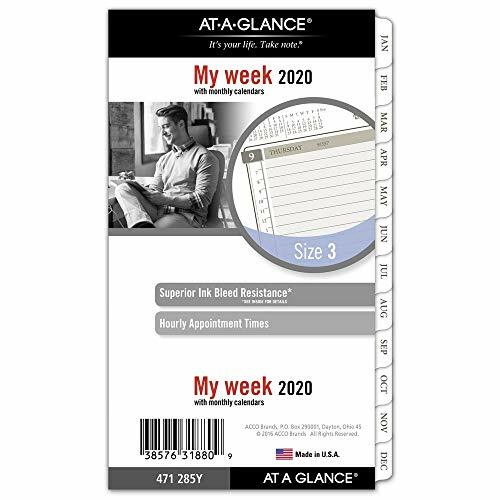 The AT-A-GLANCE Day Runner Planner Refill covers 12 months, January 2020-December 2020. Plan your schedule without fear of distracting ink bleeding. Our improved, high-quality paper is designed for superior ink bleed resistance, which keeps plans neat and legible. One month covers a two page spread. Features unruled daily blocks for open scheduling of upcoming deadlines, appointments and more. Pages measure 5-1/2" x 8-1/2". Refills allow you to reuse your favorite refillable cover each year. This refill is pre-punched for use in a 7 ring, desk size (size 4) organizer, sold separately. Expand your organizational skills with special features, including: a ruled notes column on each spread for to-do lists and reminders. YEAR-ROUND PLANNING - Refill covers 12 months, January 2020-December 2020 with Julian dates. Keep track of deadlines, special events and more with clear and simple organization. INK BLEED RESISTANCE - Plan your schedule without fear of distracting ink bleeding. Our improved, high-quality paper is designed for superior ink bleed resistance, which keeps plans neat and legible. MONTHLY VIEWS - One month covers a two page spread. Features unruled daily blocks for open scheduling of upcoming deadlines, appointments and more. Pages measure 5-1/2 x 8-1/2. ENHANCED ORGANIZATION - Expand your organizational skills with special features, including: a ruled notes column on each spread for to-do lists and reminders. The Moleskine Monthly Notebook is dated from July to December. This planner shows each month across a two-page spread, followed by a double ruled page between each month for note-taking. 51 ruled pages are included at the end, offering extra space for organizing and planning the year. The perfect combination of freedom and organization. 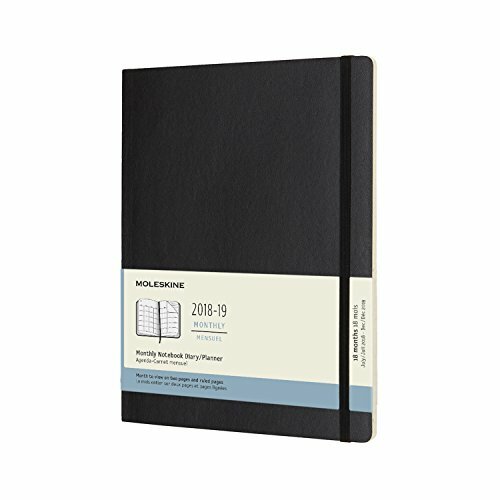 MOLESKINE MONTHLY PLANNER: Moleskine monthly planners are perfect for business planning, travel planning, bullet journals & fitness journals. Each month gets a 2 page spread, with blank pages for notes, so you can track projects & keep your appointments. Keep track of deadlines, special events and more with clear and simple organization. 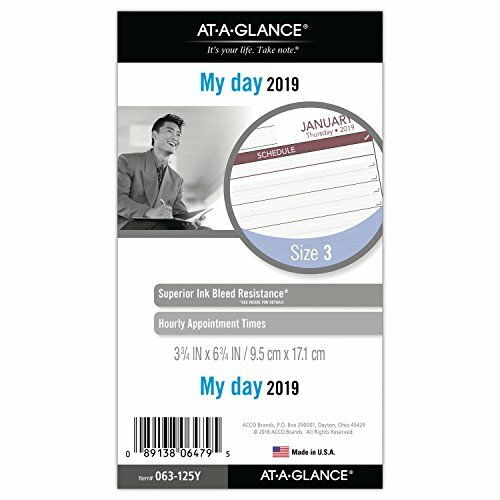 The AT-A-GLANCE Day Runner Planner Refill covers 12 months, January 2020-December 2020. Plan your schedule without fear of distracting ink bleeding. Our improved, high-quality paper is designed for superior ink bleed resistance, which keeps plans neat and legible. Keep meetings, events and more recorded in the weekly and monthly spreads. Calendar reference blocks are included on each spread. 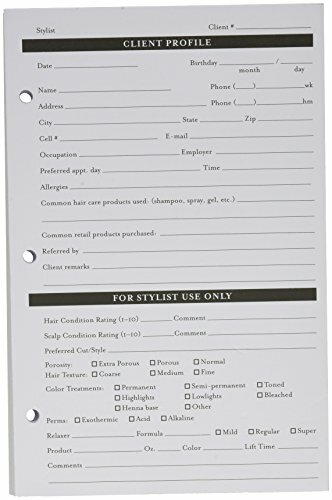 Pages measures 3-3/4" x-6-3/4". Break your day into manageable 1-hour periods. Appointment times run 8:00 a.m. 5:00 p.m. Monday Friday. Weekends are condensed with 7:00 a.m., 12:00 p.m. and 6:00 p.m. ticks. Refills allow you to reuse your favorite refillable cover each year. This refill is pre-punched for use in a 6 ring, portable size (size 3) organizer, sold separately. WEEKLY & MONTHLY OVERVIEWS - Keep meetings, events and more recorded in the weekly and monthly spreads. Calendar reference blocks are included on each spread. Pages measures 3-3/4 x-6-3/4. 1-HOUR APPOINTMENTS - Break your day into manageable 1-hour periods. Appointment times run 8:00 a.m. - 5:00 p.m. Monday - Friday. Weekends are condensed with 7:00 a.m., 12:00 p.m. and 6:00 p.m. ticks. REFILL ONLY - Refills allow you to reuse your favorite refillable cover each year. This refill is pre-punched for use in a 6 ring, portable size (size 3) organizer, sold separately. Keep track of deadlines, special events and more with clear and simple organization. 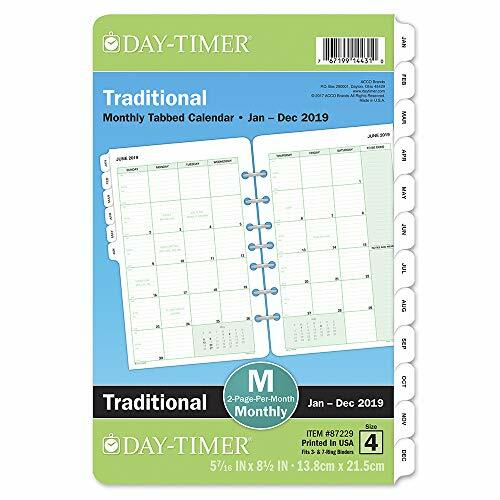 The Day-Timer Kathy Davis Monthly Planner Refill covers 12 months, January 2020-December 2020. Let the designs of the world-renowned artist Kathy Davis brighten up your plans. This refill lets you plan for the year alongside colorful artwork and inspiring quotes. One month covers a two page spread. Features unruled daily blocks, space for an action list and memos and 2 reference calendar blocks. Pages measure 5-1/2" x 8-1/2". Refills allow you to reuse your favorite refillable cover each year. This refill is pre-punched for use in a 7 ring, desk size (size 4) organizer, sold separately. Expand your organizational skills with specialized features, including: tabbed months and a page locator. KATHY DAVIS DESIGNS - Let the designs of the world-renowned artist Kathy Davis brighten up your plans. This refill lets you plan for the year alongside colorful artwork and inspiring quotes. MONTHLY VIEWS - One month covers a two page spread. Features unruled daily blocks, space for an action list and memos and 2 reference calendar blocks. Pages measure 5-1/2 x 8-1/2. SPECIAL FEATURES - Expand your organizational skills with specialized features, including: tabbed months and a page locator. Keep track of deadlines, special events and more with clear and simple organization. 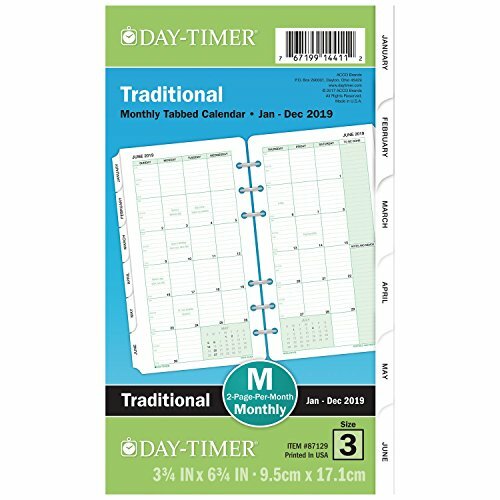 The Day-Timer Kathy Davis Weekly Planner Refill covers 12 months, January 2020-December 2020. Let the designs of the world-renowned artist Kathy Davis brighten up your plans. 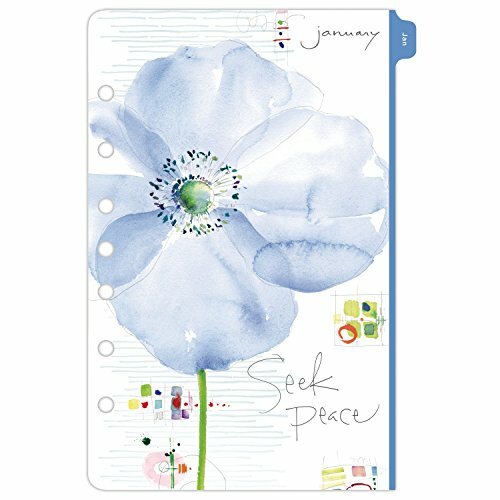 This refill lets you plan for the year alongside colorful artwork and inspiring quotes. One week covers a two page spread. Each day has ruled space for planning, notes and appointments. Pages measure 5-1/2" x 8-1/2". Break your day into manageable 1-hour periods. Appointment times are available 8:00 a.m. 5:00 p.m. Monday Friday and 8:00 a.m. 12:00 p.m. on weekends. Refills allow you to reuse your favorite refillable cover each year. This refill is pre-punched for use in a 7 ring desk size (size 4) organizer, sold separately. Expand your organizational skills with specialized features, including: tabbed monthly overviews and a page locator. WEEKLY VIEWS - One week covers a two page spread. Each day has ruled space for planning, notes and appointments. Pages measure 5-1/2 x 8-1/2. 1-HOUR APPOINTMENTS - Break your day into manageable 1-hour periods. Appointment times are available 8:00 a.m. - 5:00 p.m. Monday - Friday and 8:00 a.m. - 12:00 p.m. on weekends. Keep track of important deadlines, special events and more with clear organization and unique style. The AT-A-GLANCE Pebble refill covers 12 months from January 2019-December 2019. Add a touch of lively style to your daily routine. For use with the Pebble cover series, pages features vibrant designs and monthly motivational sayings. Base sold separately. Plan your schedule without fear of distracting ink bleeding. Our improved, high-quality paper is designed for superior ink bleed resistance, which keeps plans neat and legible. Each day Monday-Sunday has a ruled section for detailed planning, while a notetaking area lets you write out ideas. Pages measure 5-1/2" x 8-1/2", with one week per two-page spread. Perfect for long-term planning, each tabbed month covers a two-page spread. Features unruled daily blocks for free-form scheduling and a notetaking space to jot down reminders. Fits planners with a 7-ring fixture. Expand your organizational skills with specialized pages. Includes a storage pocket, 1 bonus month, 1 future planning page and 14 notetaking pages. YEAR-ROUND PLANNING - Refill covers 12 months from January 2019-December 2019. Keep track of important deadlines, special events and more with clear organization and unique style. BRIGHT DESIGN - Add a touch of lively style to your daily routine. For use with the Pebble cover series, pages features vibrant designs and monthly motivational sayings. Base sold separately. WEEKLY OVERVIEW - Each day Monday-Sunday has a ruled section for detailed planning, while a notetaking area lets you write out ideas. Pages measure 5-1/2 x 8-1/2, with one week per two-page spread. 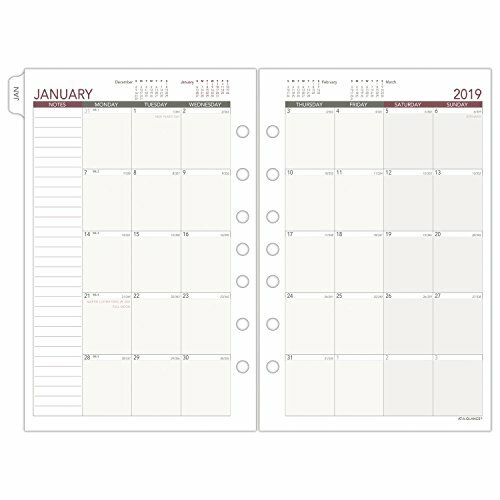 TABBED MONTHS - Perfect for long-term planning, each tabbed month covers two pages. Features unruled daily blocks for free-form scheduling and a notetaking space. Fits planners with a 7-ring fixture. ENHANCED ORGANIZATION - Expand your organizational skills with specialized pages. Includes a storage pocket, 1 bonus month, 1 future planning page and 14 notetaking pages.